The second-largest gold nugget in existence, displayed in a Las Vegas casino conveniently named the Golden Nugget. Despite its record-breaking size, you may have to do a bit of hunting to find the world’s second-largest intact gold nugget. A new kind of theme park for adults off the Las Vegas Strip. This institution collects the history of burlesque dancing with a titillating collection of ephemera and pasties. Casinos are purposefully designed to keep you inside of them—mirrors, distractions, a lack of clocks, and confusingly identical hallways leading to even more gambling adventures are all part of a strategy to keep you in and keep you playing. Because of this, you’ll have to be diligent and thorough to locate the impressive chunk of metal glowing warmly in its display case. Move through the flashing lights and maddening din of bells and siren-like winning! 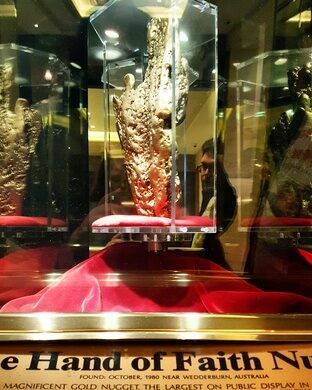 sounds to the hotel area, and in a quiet, unassuming hallway you will find it—the Hand of Faith. One might assume that this massive nugget was discovered here in Vegas, or at least somewhere in the gold-heavy west during the heyday of the Gold Rush. But, strangely, the Hand of Faith was discovered in 1980—not by a mining company or lucky settler seeking fortune in the Nevada hills, but in the small Australian town of Wedderburn by a guy taking a new toy out for a whirl. Kevin Hillier went out one fine spring day to see what tiny metal treasures his new metal detector could unearth. In a stroke of mind-blowing luck, he managed to locate the largest gold nugget ever found with a metal detector, which also happened to be the second-largest nugget ever discovered, period, a whopping 875 troy ounces. The 61-pound mass of gold was only a mere six inches below the surface. After an exciting press conference and some accolades, Hillier sold his gold nugget to the Golden Nugget casino in Las Vegas, Nevada, for over a million dollars. The nugget can be viewed in a hallway near the hotel lobby, its value rising and falling daily but its shining magnificence remaining forever priceless. Inside the Golden Nugget casino, head toward the back of the casino and into the hotel area. The Hand of Faith is located inside a wall display near the hotel lobby. Fans of vintage Vegas, kitsch, and toy pony-based gambling now flock to a casino called The D.
The bullet-riddled wall from the St. Valentine's Day Massacre, bloodstains enhanced for your viewing pleasure. A piece of the iconic wall found an unlikely new home in a Vegas bathroom. The smallest museum in Basel, Switzerland, is a two-foot-by-two-foot window in the door of a 600-year-old house.